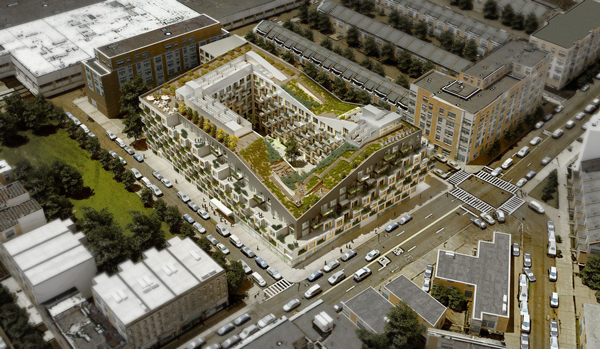 Bushwick’s Rheingold Brewery development will feature 20 percent affordable housing, despite efforts from local politicians and community to pressure the developers to build more. Simon Dushinsky and Isaac Rabinowitz’s Rabsky Group and Yoel Goldman’s All Year Management are building 1,411 new apartments at the site. The site’s previous owners, Read Property, made a non-binding agreement with the city to ensure that 24 percent of the apartments would be affordable. But under the zoning resolution, All Year and Rabsky only have to make sure 20 percent of the apartments are affordable. That works out to be 88 fewer apartments that was originally promised, according to DNAinfo. “We had no legal right to require anything more than 20 percent affordable housing as stated by the zoning resolution,” Louise Carroll, the Associate Commissioner of Housing incentives at the Department of Housing and Preservation said at a recent meeting. Read Property spent several years assembling the Rheingold Site and in 2013 received approval for a rezoning paving the way for a 10-building, 977-unit residential complex. How LGBT-friendly is the real estate industry?